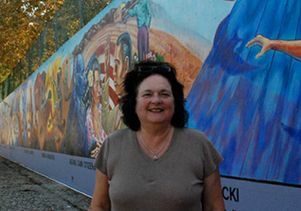 Judith Baca, acclaimed muralist, arts activist and professor in the UCLA César E. Chavez Department of Chicana and Chicano Studies as well as the Department of World Arts and Cultures/Dance, has been named the 2015 USA Rockefeller Fellow, Visual Arts, by United States Artists (USA). The honor includes a $50,000 grant from the national and arts-advocacy agency. USA Fellowship Grants are unrestricted, allowing artists to use the funds in any way that will best support their practice. Among Baca's many works is the acclaimed epic mural in the San Fernando Valley, "The Great Wall of Los Angeles," which extends for more than a half-mile along the concrete walls of the Tujunga Wash. Baca is also the co-founder of SPARC (Social and Public Art Resource Center), a Los Angeles-based non-profit public art and community arts-education collective.